Climate change is no longer a purely environmental issue, it has far reaching implications for almost every organism on earth. Human beings- the drivers behind the accelerated anthropogenic climate change are also victims of their own industrial legacy. The effect of climate change on human health although largely taken for granted is a serious issue. Like other vagaries of climate change, it is felt most harshly by geographically and economically vulnerable communities; especially in developing countries (DCs) and least-developed countries (LDCs). 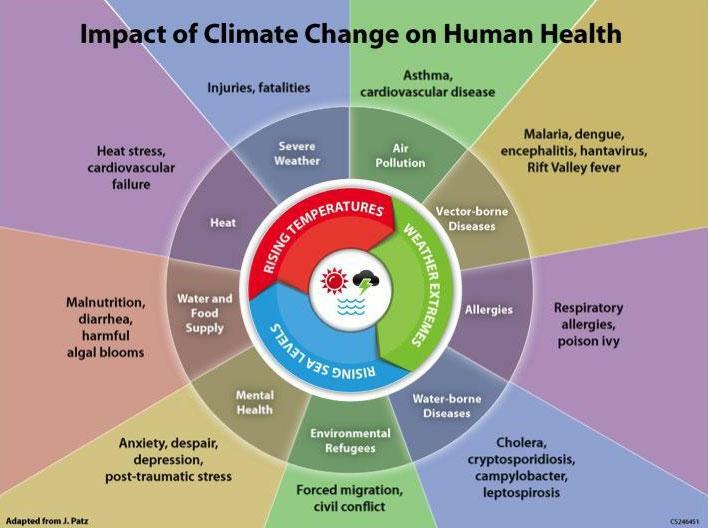 The impacts of climate change on human health. Source: US National Oceanic and Atmospheric Administration. June 2015. Increased concentration of C02 in the atmosphere is a leading cause for respiratory problems and extreme weather patterns result in millions of casualties every year. Natural disasters like acute floods and droughts claim thousands of lives and also cause a great deal of climate induced migration and displacement. Food security is a major challenge for most DCs and LDCs and climate change adds further complexity to this problem. Approximately 842 million (12% of the global population) people suffer from hunger worldwide out of which ninety-eight percent of those who suffer from hunger live in DCs and LDCs. 553 million live in the Asian and Pacific regions, while 227 million live in Sub-Saharan Africa. Latin America and the Caribbean account for 47 million. As per a 2017 report by the Global Hunger Index (GHI), India is one of the top countries suffering from a serious hunger crisis. It is no secret that climate change has directly impacted agriculture across the world and is responsible for decrease in crop yields caused by erratic droughts and floods. A recent scientific study published in the Nature journal in 2014 has also shown that several staple crops are losing their nutritional value due to the impact of climate change and increased CO2 levels in the atmosphere. The findings of this study have been corroborated by scientific reports by the WHO and other international organizations as well. “We found rising levels of CO2 are affecting human nutrition by reducing levels of very important nutrients like iron and zinc, as well as cutting protein levels in very important food crops,” says Prof. Samuel Myers, an environmental health expert at Harvard University. Although this problem may not appear significant from a developed country’s perspective, it has a severe impact on DCs and LDCs struggling with food insecurity. Declining protein and micronutrients in in staple crops like rice, maize, wheat, etc. causes malnutrition and weakens our immune system. Weakened immune systems make us more vulnerable to infectious diseases such as malaria, dengue and other tropical diseases whose spread is catalyzed by warmer temperatures according to a WHO Report on Climate Change and Diseases. Under the circumstances, climate adaptation is the obvious need of the hour. Adaption using biotechnology in the field of agriculture is critical in order to provide food security to vulnerable communities across the world, especially in the Global South. Over the last few decades, biotechnology has evolved significantly and genetically modified organisms (GMOs) have been on the rise in several countries including DCs and LDCs. GMOs have found their way into agriculture, fisheries and livestock farming and in some cases; certain varieties of GMOs have been proven to be more resistant to the vagaries of climate change. Efficiently harnessing and utilizing these climate resilient GMOs has the potential to mitigate the adversities of climate change on food security and health. However, some Governments and NGOs have adopted a stubborn stance against GMOs in agriculture. They believe that adopting GMOs in our diet pose severe health hazards and also negatively affect the environment. While there is great scientific consensus about the positive effects of climate resilient GMOs in agriculture and the negligible adverse impact on health, these Governments and NGOs continue to debunk such scientific research and instead continue to support other research which shows that there may be certain health hazards associated with GMOs. These anti-GMO lobbyists are also influenced by irrational myths and non-scientific ideologies. In 2015, the U.S. National Academy of Sciences (NAS) published the results of a long term comprehensive assessment of safety, efficacy and future of GM crops and found that they had no adverse impact on health and environment. Some examples of successful climate resilient GM crops are DroughtGard- a variety of corn produced in the U.S. which can withstand severe water shortages; GM soybean produced in Argentina which can withstand draughts and GM Cotton from India which can withstand extreme weather conditions. Recently, Tanzania has made a breakthrough in climate change adaptation by overcoming its irrational GMO phobia and introducing a drought resilient variety of GM corn which will be closely monitored over the next few years. A review of national biotechnology laws of various countries as well as international conventions indicate that GMOs are heavily regulated and are approved only after completion of careful research and stringent field trials. However, the anti-GMO lobby continues to gain popularity in several countries in the Global South even as millions suffer due to food shortage. This scientific debate on the actual risks of accepting or rejecting GMOs in our diet is almost as never ending as the debate questioning anthropogenic reasons for climate change. Like the climate change debate, the GMO and health debate also has much scientific research from opposing ends of the spectrum. However, the one thing that is absolutely certain is this: erratic weather patterns are disrupting traditional agriculture and enhancing food insecurity concerns worldwide. In order to protect the most vulnerable communities from acute starvation, malnutrition and other diseases, food security is a priority for Governments as well as international organizations. GMOs may or may not have serious implications on human health, but starvation and malnutrition in the wake of the present climate change fueled food insecurity, coupled with the global rise in serious infectious diseases is sure to wipe out poor and vulnerable communities in the near future unless biotechnology driven adaptation measures are implemented in the agricultural sector worldwide in addition to other climate mitigation efforts. Ha ha, very funny. Nice try, Monsieur Santo & Friends. However, people of the world are not taken in for one moment by propagandists for the agri-chemicals corporations. There are a myriad ecological ways of solving challenged of producing food insustainable ways and being prepared to adapt to shifting climatic patterns. They don’t involve profiteering, intoxication, impoverishment or forced removals.